Air filters remove soot, pollen, fine dust and other particles from the air. Through the efficient and reliable filtering, air filters ensure an optimal air fuel mixture, and thus provide for a consistent engine performance. Filters of the DT® Spare Parts brand are designed in such a way, that they fit perfectly to the filter housing. In this way, deformation of the filter is prevented, and the air can circulate efficiently through the air filter. The decisive factors here are the dimensions of the filter, the choice of materials for the individual components, as well as the stability of the inner and outer wall. 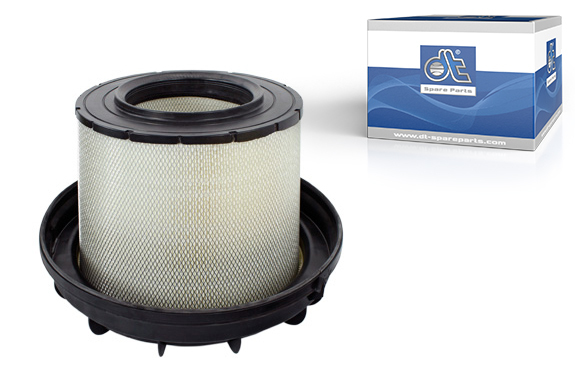 To guarantee high filtration efficiency, the filter media used in air filters of the brand DT® Spare Parts are specifically tailored to the individual vehicle application. For this purpose, filter types made of composite fibre, plant fibre, paper pulp, felt and flame-retardant materials are deployed. To increase safety, more and more air filters of the DT® Spare Parts brand are being equipped with flame-retardant material. The basis of the fire retardancy is a special resin, with which the cellulose filter material is impregnated. This treated filter paper can, indeed, catch fire, but goes out immediately. Engine fires, for example, which are caused by burning cigarette ash that has entered the air filter through the inlet port, can thus be prevented. In addition to air filters, the brand DT® Spare Parts also offers all standard cartridge filters, change filters and cab air filters.